The Pigeon Breeding Department at the Imperial Russian Society of Acclimatization of Animals and Plants held a pigeon race on June 14. The pigeons were released from the station of Nazarovka on the Moscow-Kazan railway at a distance of 211 miles from Moscow. 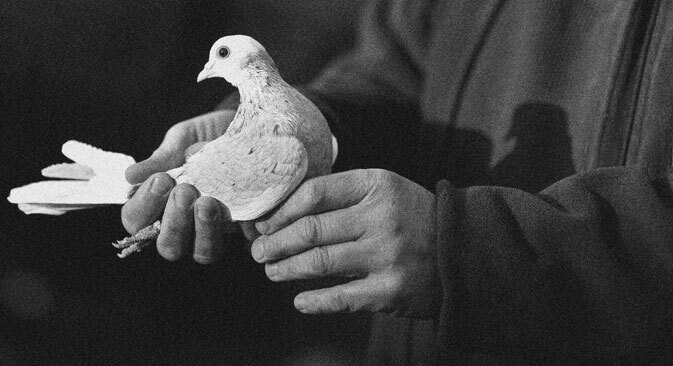 Thirty-two pigeons belonging to the Pigeon Breeding Department were launched at 5 a.m. The first award went to a pigeon owned by A. Chesnakov that flew in at 11:25 a.m., the second and third to the Society of Acclimatization. The next competition will be held on June 28; the pigeons will fly a distance of 279 miles. The Krestetskoye District Police Department is looking for the owners of a stray horse being kept in custody by peasant Yov Vasilyev. The identifying characteristics of the horse: gelding; below average height; chestnut color; 8-year-old; right ear cut off; two white spots near the withers; a horsehoe on the right foot; left-sided mane; bell on a cord around the neck. A thunderstorm and downpour, which lasted for about an hour, and heavy hail, broke out over Moscow at 2 p.m. yesterday. The storm was preceded by a hurricane that felled many trees. Especially strong was the hail in the northern part of Moscow. A lot of glass was broken in almost all the houses near Krestovskaya Gate and many other streets and alleys. The buildings of the Engineering School, Seminary and Maryinskaya Hospital were heavily damaged. The hurricane produced severe damage in suburban areas. The damage caused by the hail and the hurricane is significant. Berry season is already in full swing. But this “swing” bears very little resemblance to the tremendous excitement that has always reigned at this time of year on the berry market in general and in particular at the Shchukin market – Petrograd’s main fruit artery. At the beginning of the berry season, Petrograd was eating mainly berries brought from Poland and the Northwestern region. But Poland failed to deliver anything to the berry market in Petrograd, while the Northwestern region brought a small amount of berries to market, but it was only a drop in the ocean of the need that is felt in Petrograd. One cannot say that the berry crop on the sites in western Russia has been poor, but the berries that are cultivated there – strawberries and cherries – are too tender to survive long-distance transportation by rail. For the moment, we are all too occupied with the present situation to be able to calmly and fully appreciate all that is happening around us. But with the passing of time, the whole world will marvel at what we all were witnessing. We will be envied for living in these great days, for having been filled with the feelings that we experience, for having been eyewitnesses and contemporaries of great events, the heroic deeds of not only individuals, but entire nations, the like of which is unknown in world history. This war is a war of ideas, in which every participant not only on the battlefield, but also in society, should act with a raised visor and a certain motto on their shield.